This is my very favorite Lilly Pulitzer dress. (I know, I say that about most of my LPs.) So it felt very appropriate to wear it today as my last hooray to summer. This isn't me by the way. I think those shoes look ridiculous on the model. I wore my pink and white monogrammed Bonannos. And begged summer to sick around for another month or six. Fall is already knocking on the door and leaves are already starting to turn. Boo. Don't get me wrong, I adore fall. But the six months of winter that quickly follow fall are just depressing to think about. So long, farewell summer! You'll be missed!! What did you wear on this last glorious day of summer? Ooo, that's beautiful. What year is it? PIP- I think it is from a year or two ago. I bought it on Rue. PPC, I had EVERY intention of putting on my VS white linen pants. I love them and hate and I mean HATE to think they'll be collecting dust for 8 months!! Nothing so chic, I'm afraid, although I did wear one of my most summery yellow&white Lilly dresses to church yesterday. ;) My poor Pretty Little Bare Feet & I are both sickly w/ sore throats from postnasal drip. So all I managed to get out of my closet today were my favorite white tapered cropped pants from WH/BM & a zebra print sleeveless top...& the farthest I managed to go was to my back patio. What a perfect dress to wear to say goodbye to the summer! I am not sure I should even mention what I wore today--it was a day of errand running and relaxing. ;) Over the weekend I did go to a wedding though and wore a very summery Lilly dress! Beautiful dress! 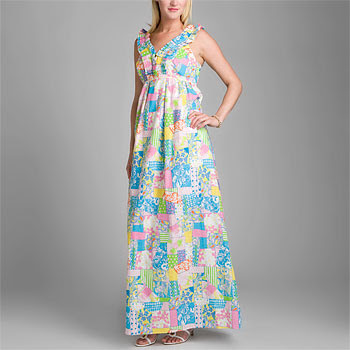 I wore Lilly today too to commemorate the last day of summer. I wish summer was all year long! Beautiful!! Great choice for the last day of summer! We were on the lake all day so I sported my favorite bikini. I have this dress! I LOVE IT!!!! Its definitely my FAVE summer dress!!!!! I wore my Lilly today too in celebration of the last day of summer! I wore the Downie wrap dress with the lemon and lime print on it with green croc McKims. Bye bye summer!